A dual master’s degree is the preferred degree for reference positions at many academic and research libraries. The first online dual degree - MLIS/IT (MS in Library and Information Science/MS in Instructional Technology) is now available at Southern Miss. Requirements for the dual degree are listed at: http://www.usm.edu/library-information-science/dual-mlis-programs. Application for the dual master’s as well as the MLIS degree, MLIS with school licensure emphasis, Graduate Certificate in Archives and Special Collections and Graduate Certificate in Youth Services and Literature is available online. The Southern Miss School of Library and Information Science (SLIS) is now accepting applications for summer and fall 2016. http://www.usm.edu/graduate-school/apply-graduate-school. The School of Library and Information Science is pleased to announce the 49th annual Fay B. Kaigler Children’s Book Festival, to be held April 6-8, 2016, at the Southern Miss Thad Cochran Center. The highlight of the festival is the presentation of the Southern Miss Medallion awarded to an author or illustrator for his or her body of work. The 2016 Southern Miss Medallion winner is Jacqueline Woodson. Jacqueline Woodson is the 2014 National Book Award Winner for her New York Times bestselling memoir, Brown Girl Dreaming. The author of more than two dozen books for young readers, she is a four-time Newbery Honor winner, a recipient of the NAACP Image Award, a three-time National Book Award finalist, a two-time Coretta Scott King Award winner and was recently named the Young People’s Poet Laureate by the Poetry Foundation. Michael Cart, a columnist and reviewer for Booklist magazine, is a leading expert in the field of young adult literature. The author or editor of 23 books including his history of young adult literature From Romance to Realism and the coming of age novel My Father’s Scar, an ALA Best Book for Young Adults, he is a past president of both the Young Adult Library Services Association and the Assembly on Literature for Adolescents of the National Council of Teachers of English. He is the 2000 recipient of the Grolier Award and the first recipient of the YALSA/Greenwood Press Distinguished Service Award. 2003 Southern Miss Medallion Winner Lois Lowry is one of the world’s most beloved and versatile authors for children and young adults. She is the author of more than forty books, including the popular Anastasia Krupnik series. She has sold millions of books worldwide and twice received the prestigious Newbery Medal, for Number the Stars in 1990 and The Giver in 1994. Other honors she has earned include the Boston Globe-Horn Book Award, the Dorothy Canfield Fisher Award, the California Young Reader’s Medal, and the Mark Twain Award. For her contributions as a children's writer, she is the U.S. 2016 nominee for the biennial, international Hans Christian Andersen Award; she was a finalist in 2000 and nominee in 2004. In 2007 she received the Margaret A. Edwards Award for her contribution to young adult literature. As Executive Director of the Ezra Jack Keats Foundation, Dr. Deborah Pope has directed its work toward increasing diversity in children’s literature and enriching the quality of public education. Through her efforts, the Ezra Jack Keats Book Award is recognized internationally as an imprimatur of quality children’s books for a multicultural audience. Deborah came to the Foundation after an extensive career in theater and arts-in-education. She has two daughters, and lives with her husband in Brooklyn, New York. Joyce Sidman is the winner of the 2013 NCTE Award for Excellence in Children's Poetry and author of many award-winning children’s poetry books, including the Newbery Honor-winning Dark Emperor and Other Poems of the Night, and two Caldecott Honor books: Song of the Water Boatman and Other Pond Poems (also a Lee Bennett Hopkins Poetry Award winner) and Red Sings from Treetops: A Year in Colors (which won the Claudia Lewis Poetry Award). She teaches poetry writing to school children and participates in many national poetry events. Her recent book, What the Heart Knows: Chants, Charms & Blessings, has been critically acclaimed and was a finalist for the Los Angeles Times Book Award. Joyce lives with her husband and dog near a large woodland in Wayzata, Minnesota. Since entering the world of children’s books with illustrations for the first of James Howe’s Pinky and Rex easy reading series, Melissa Sweet has illustrated many children’s books, from board books to picture books and nonfiction titles. She received a Sibert Medal for Balloons over Broadway and Caldecott Honors for A River of Words by Jen Bryant and The Right Word: Roget and His Thesaurus also by Jen Bryant, as well as two New York Times Best Illustrated citations. Her collages and paintings have appeared in the New York Times, Martha Stewart Living, Madison Park Greetings, Smilebox and for eeBoo Toys, which have garnered the Oppenheim and Parents Choice Awards. Melissa currently lives in Rockport, Maine, and loves riding her bike and hiking with her two dogs, Rufus and Nellie. Melissa’s newest book, Some Writer! The Story of E.B. White is a biography of America’s beloved author, to be published in fall 2016. Tim Tingle is an Oklahoma Choctaw and an award-winning author and storyteller. His great-great grandfather, John Carnes, walked the Trail of Tears in 1835, and his paternal grandmother attended a series of rigorous Indian boarding schools in the early 1900s. Responding to a scarcity of Choctaw lore, Tingle began collecting tribal stories in the early 90s. His first children’s book, Crossing Bok Chitto, (Cinco Puntos Press, 2005), garnered over twenty state and national awards. In 2010 Tingle released Saltypie and contributed the story "Rabbit’s Tail Tale" to multiple-award winning anthology, Trickster. Both Saltypie and Trickster were selected as 2011 American Library Association Notable Books. Author of several award winning novels, Rita Williams-Garcia continues to break new ground in young people’s literature. Known for their realistic portrayal of teens of color, Williams-Garcia’s works have been recognized by the Coretta Scott King Award Committee, PEN Norma Klein, American Library Association, and Parents’ Choice, among others. She says, “My readers are always sharper than my characters. They are always telling the characters a thing or two. I like that. That’s why I enjoy writing for teens. Teens think. They question.” Rita recently served on the National Book Award Committee for Young People’s Literature and is on faculty at Vermont College MFA Writing for Children and Young People. The Fay B. Kaigler Children’s Book Festival is Proud to Host the Ezra Jack Keats Book Awards. Since 1985, the Ezra Jack Keats Book Awards have been given to an outstanding new writer and new illustrator of picture books for children who share Ezra’s values: the universal qualities of childhood and multicultural nature of our world. Now in partnership with the de Grummond Children’s Literature Collection, the EJK Book Awards continue to encourage the next generation of talent who are committed to celebrating diversity through their writing and art. For more information, including the tentative schedule and registration information, please visit www.usm.edu/children-book-festival or call the USM School of Library and Information Science at 601.266.4228. Nathan Howe joined Hinds Community College Libraries January 4, 2016, as the Reference Librarian at McLendon Library on the Raymond Campus. He comes to Hinds after serving as a technical services assistant for the Jackson Hinds Library System, where he previously served as interlibrary loan officer. He had worked with the Jackson Hinds Library System since August 2010. He graduated from the School of Library and Information Science at the University of Southern Mississippi in August 2014. He also holds a master’s degree in philosophy from the University of Mississippi. In December 2015, Joyce Shaw and Peter Dean became the recipients of the first Friends of University Libraries’ grant to purchase award winning children’s books that portray Autism Spectrum Disorder (ASD) in a realistic way. Shaw and Dean compiled a bibliography of the books as part of a poster presentation at the 2015 Fay B. Kaigler Children’s Book Festival. From this list of twenty-two books, eighteen were not owned by University Libraries in one or more collections. This award will benefit three University Libraries’ collections that include children’s literature: the de Grummond Children’s Literature Collection, Cook Library Curriculum Materials Center and Gulf Coast Library Curriculum Lab. It is with great sadness that we inform you of the death of Miss Jane Smith. Mary Jane Smith, 69, passed away Tuesday, January 26, 2016 at St. Dominic Hospital in Jackson. A private graveside service will be held by the family. Miss Smith was born in Little Rock, Arkansas in Pulaski County. She was a longtime resident of Jackson, retiring as Assistant Director of the Mississippi Library Commission after 40+ years of loyal service. Miss Smith enjoyed needlepoint, cross stitch and reading. Reading was her life, giving her great joy. She was a loving sister, friend to many, a woman of her word and someone you could always count on. Miss Smith started at MLC as a Library Consultant March 1, 1980. She held a variety of positions and titles in the thirty years she worked there, including Library Consultant Supervisor, Acting Assistant Director for Library Development, Assistant Director for Library Development, Deputy Director, Director of Public Services, and Acting Director of the Mississippi Library Commission. (She held this last position not once, but twice.) Jane was also the 2006 MLA Peggy May Award winner. In 1992, she was key in securing $10 million in bond funding for public libraries. This was the first time the Mississippi Legislature had approved such funding for public libraries. It led to 100 new and newly renovated public library buildings in the state. Miss Smith was the person who contacted Senator Gray Ferris about developing a statewide collection of databases for use by public libraries. Ferris thought it was a great idea that academic, public, and school libraries joined forces to get legislative support. The end result was MAGNOLIA, which is still in use today. Other states followed Jane's and Mississippi's lead and began offering statewide access to databases. MLC Executive Director Susan Cassagne said, "She was a presence. She was always fair and ready to listen. She was an integral part of the MLC family for many years; she will be missed. Please keep her family in your thoughts and prayers." Julia M. Rholes, Dean of Libraries at the University of Mississippi, is retiring at the end of December after twelve years of service to the University. She can be credited with the creation of a Library Annex for the storage of archival materials and lesser used collections. This helped free up space to transform the library to better meet the needs of the students and faculty. She led several renovation projects, including the creation of several commons spaces, and a crowdfunding initiative that built StudioOne, a one stop video recording and editing studio. The addition of comfortable seating and a coffee shop created a welcoming environment for the students. Rholes also oversaw the growth of critical research collections and the digitization of many archival and accountancy collections. Angela Barlow Brown, director of development for special projects at UM said “I love her passion for serving the students. She wants only the best for them that she can provide as a dean and as a library team member.” The University of Mississippi is thankful for her dedication to the library and we wish her the best in retirement. It is with great sadness that we inform you of the death of Mr. Billy Beal, who served on the MLA Executive Board in the position of ALA Councilor. The Meridian Community College will hold a memorial service for Vice-President Billy Beal at 2:00 p.m. Thursday, December 10 in the McCain Theater. Mr. Beal's visitation will be at Berry & Gardner Funeral Home on Sunday evening December 13 from 5:00 to 7:00 p.m. The funeral service will be held at 11:00 a.m. Monday morning, December 14 at Saint Joseph Catholic Church in Meridian. Community Forum "'A Shaky Truce': Civil Rights Struggles in Starkville, MS, 1960-1980"
On Thursday, October 29th, representatives from the MSU History Department and the MSU Libraries hosted a community forum on the history of Starkville’s civil rights movement at the Hilton Garden Inn of Starkville, MS. The forum was a culmination of the work produced from the Starkville Civil Rightsproject, which began as a partnership in the summer of 2014. This event was funded by the Mississippi Humanities Council. The forum debuted a new digital history website (http://starkvillecivilrights.msstate.edu) on Starkville’s civil rights movement that includes a searchable collection of oral history interviews with local Starkville participants, archival documents from the Mississippi State University Libraries and other collections, and classroom resources developed with Mississippi teachers in mind. Hillary Richardson, MSU Libraries Humanities Librarian, welcomed the audience and introduced and Dr. Stuart Rockoff of the Mississippi Humanities Council; Nickoal Eichmann, MSU Libraries History Librarian, gave a preview of the website and highlighted its unique features, and Dr. Judith Ridner, Associate Professor of History, presented on some of the themes from the oral histories themselves. The forum also featured a panel of historians and project participants who discussed Starkville’s movement and its importance in Mississippi and the nation. Panelists included Dr. Michael Vinson Williams, Dean of Social Sciences at Tougaloo College; Dr. Stephanie Rolph of Millsaps College; Dr.Shirley Hanshaw of Mississippi State University, who was interviewed for the project; Mr. Chris Taylor, President of the Oktibbeha County chapter of the NAACP, who was also interviewed for the project; and Mr. Nick Timmerman of Mississippi State University, project staff member and moderator of the panel. Following the program, audience members had the chance to interact with the Starkville Civil Rights Website and to record their own brief memories of Starkville's civil rights movement for future inclusion in the site. Recording equipment for the forum was purchased through an Institute of Museum and Library Services grant made available through the Mississippi Library Commission as apart of the Mississippi Library Leadership Institute. 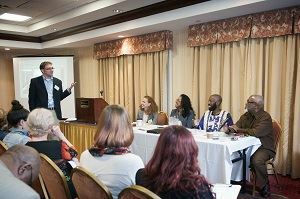 The forum was made possible by a grant from the Mississippi Humanities Council, through support from the National Endowment for the Humanities. Any views, findings, conclusions, or recommendations expressed in this program do not necessarily represent those of the National Endowment for the Humanities or the Mississippi Humanities Council.The representatives from the MSU History department and Libraries are still actively interviewing those who may remember or have participated in Civil Rights struggles in and around Starkville, MS. If you would like to be interviewed, or if you would like to refer someone else who might be interested in participating in an interview, please email starkvillecivilrights@lists.msstate.edu or call (662) 325-2838. 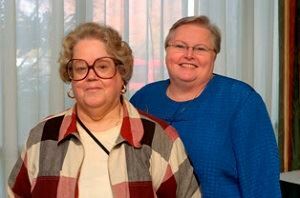 Nan Crosby (pictured left) retired as the Branch Manager of the Ridgeland Public Library with the Madison County Library System in October 2015. She has worked with the library for 25 years and has enjoyed her time as the branch manager. She plans on still being an active patron and volunteer for libraries. Antoinette Giamalva is the new Branch Manager for the Ridgeland Public Library with the Madison County Library System. She received her MLIS from University of Southern Mississippi in 2013 and has worked previously for the Flowood Public Library as a Children’s Supervisor Assistant and Reference Librarian. She has also worked at the Delta State University Library as a Reference Librarian and an Access Services Librarian. She has presented at various conferences and has had various articles published. She is looking forward to this next stage in her life.